The European Union has to turn into a number one priority for the countries of the Western Balkans not only in words but genuinely. 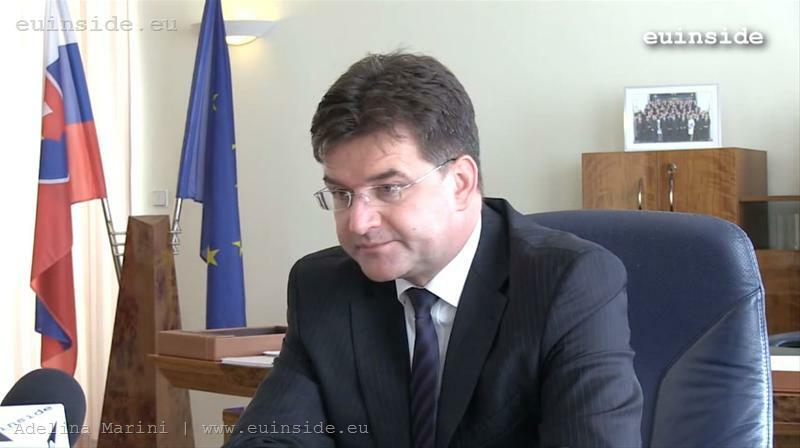 For Albania, Bosnia and Herzegovina, Serbia and Macedonia, the main priorities are different, said in an interview for euinside Miroslav Lajčák, a deputy prime minister and foreign and EU affairs minister of Slovakia, who has huge experience with the countries in the region. Minister Lajcak was a managing director for Europe and Central Asia in the European External Action Service of the EU in Brussels until April this year; he was a special EU representative for Bosnia and Herzegovina in Sarajevo; a High Representative of the EU facilitating the independence referendum of Montenegro; ambassador of Slovakia in Yugoslavia (later of Serbia and Montenegro), in Albania and Macedonia; assistant to the special envoy of the secretary general of the UN in the Balkans. In Lajcak's words, for the EU enlargement has not ceased to be a priority, although enthusiasm is not there anymore. The Union, however, cannot write the homework of the countries from the region who have to visit EU capitals not for lobbying but to show results. He also believes that the Union and the member states are doing more than enough against the backdrop of the results they get in return. "It takes two to tango", he explained and pointed out that if there is "demand" there will be more offering. Regarding the question that analysts often deliberate on after the last circle of enlargement is it not time for a change of criteria, Miroslav Lajčák said: criteria no, but approach yes. The EU is a living organism which is evolving and this is why the accession criteria must be adjusted to the new realities but new conditions should not be put forward to the candidate countries. One of the lessons learned, however, is that a country has to join the EU 100% prepared without a mechanism, as is the case of Bulgaria and Romania. Besides, the countries have to be evaluated individually, on the basis of their own merits, not to be put in a package, he added and concluded that for the countries of the Western Balkans there is no better alternative than the EU. You can watch the entire interview with Mr Lajcak in the video file. euinside: First of all, thank you Minister for spending time with us. You have a long career in the Balkans, so you could have a very good perspective of where the region is going. How do see things, where are the Western Balkans headed to? Miroslav Lajčák: The region is moving in the right direction but not at the right speed. I think that the situation is good, but not as good as it could be and as it should be and it's also not proportional to the amount of investment and attention that the EU gives to the region. So, there are no reasons to be worried but there are no reasons to be complacent either. euinside: What do you think this slow speed is due to? Miroslav Lajčák: There are several reasons for that. The most important as I see it is that the European integration is not genuinely the number one priority. It is the number one priority in all the papers and the leaders are saying the right things but in real action, in daily politics, you can see that for many of them, they do not guide their decisions, their steps by the European integration as a supreme goal. I don't want to generalise, but Croatia managed to convince EU that this is a number one priority, they undertook painful steps but as a result there was consensus. Montenegro managed to again convince that for the government this is the number one priority. For the rest of the region as much as they say that this is the number one priority when it comes to dealing with concrete issues - Albania, Bosnia and Herzegovina, Serbia - you see that they have different priorities or Macedonia. euinside: Is it possible that one reason for this is that enlargement is not a priority for the EU itself? Miroslav Lajčák: No, no. Enlargement is one of the priorities for the EU but it's not the EU who should bring the countries of the Western Balkans. It's the countries of the Western Balkans who should do their homework, meaning reforms, who should change their systems, who should build European standards. EU is ready to help them, EU has a commissioner for enlargement, all the programmes, all the support, but EU cannot do the homework for the countries there. The problem of course is that compared to the Central Europe the starting point in the Western Balkans is more complicated and I also don't want to blame, I understand that when you still don't know that's the name of your country, where your country starts and where it ends, where is the border, then it's difficult to imagine that European integration is number one priority. Number one priority is to find your identity. That's also an objective reality that we have to take into account, but still successful integration process is about reforms, about meeting the benchmarks, about conditionality. It's not about lobbying capitals, because this is not a process based on political decisions, this is a process which is mostly based on results achieved on the ground because membership in the European Union is not a gift, it's not a humanitarian gesture, it's not a charity. It's something that should make EU strong and more efficient. And if a country would theoretically join the EU without being prepared for it 100% then it will hurt the country and it will weaken the EU. euinside: I spoke to an analyst quite recently on the Western Balkans and he said that a big problem is that the European institutions as such are quite involved in the process, even in the face of Commissioner Füle they have quite an innovative approach as to keep the momentum, but what lacks is support from the member states. Do you agree with this? Miroslav Lajčák: Commissioner Fule is doing a tremendous, excellent job and he really is trying to find innovative ways to keep the ball rolling, such as the high level accession dialogue for Macedonia or other forms just to make sure that we don't get stuck even if there are problems or even obstacles or blockages. When it comes to the member states, no one should be surprised that for them the priority is the consolidation of public finances and stabilisation of national currencies, of euro, it's normal. So, is there less enthusiasm for enlargement? Yes. Does it mean that enlargement is dead? No. It's here but it's no longer featured so prominently. But the fact that EU member states are now more busy with their internal economic, social, financial agenda does not prevent the countries of the region of the Western Balkans from doing their homework. And what they should do is to be coming to our capitals, showing results - we have done this, we have changed this law, we have introduced this legislation, in the name of European integration. And the reaction will definitely be positive. Miroslav Lajčák: I disagree. I don't think anyone is waiting. We are in motion, compared to last year we see clear progress on side of Croatia, on side of Montenegro. We don't see progress in Bosnia and Herzegovina but this is not for the EU to be blamed. The leaders clearly know what to do and they know exactly because the European Commission through the annual progress reports defines the situation and identifies steps to be taken. So, if these steps are not taken, then obviously there is no progress, so you should not complain about waiting if you haven't done your homework again. Which as simple as that. euinside: The Polish Institute for International Relations recently published a paper in which it says that the Visegrad group, of which Slovakia is a member, could do more sharing its experience and because all of the countries in the group have very close relations to the Western Balkans, they could do something more. Do you agree with this and if yes, what more could be done by the countries here? Miroslav Lajčák: You can always do more in everything you do, but there is no doubt that for the Visegrad Four the Western Balkans is one of the priority regions and we have a number of programmes, individually and as a group together, to help the countries of the region to basically go faster along the integration path. Our advantage is our fresh successful, first hand experience. And this is what we offer. And it depends on the countries of the region to what extent they are able and willing to use this offer. We have a V4 Visegrad fund which has its programmes for the Western Balkans, providing scholarships but we are receiving their delegations, we are sending our experts, they are doing this technical experts level work and communication which is so important because this is what moves the countries forward. So, I don't think we can do more in terms of commitment and in terms of prioritising the enlargement of the Western Balkans on our political agenda. We are providing as much money as we can afford, so I think that the V4 countries are definitely among the leaders in promoting the enlargement. euinside: So for now there is nothing more you can do? Miroslav Lajčák: You can always do more. Always do more but again it takes two to tango. Our assistance should also be in a way demand-driven - if there is higher demand then I'm sure we will find more programmes, more experts and everything. euinside: The stick and the carrot approach. Miroslav Lajčák: No, no, no. It's not the stick and the carrot but you can offer a lot but you have to find a reception to your offer. And we have to see that this or that programme enjoys support and then we will put more attention and eventually more resources into those programmes, but it must not be like we are coming and offering, imposing our experience, our knowledge, our know-how. euinside: OK, imposing, now I understand what you mean. Given the experience with Bulgaria and Romania, because you know that the two countries have this special mechanism in justice and home affairs, and unfortunately it is five years still it is there and is going to stay. Do you think that given that experience, the accession criteria should be changed for the Western Balkans because they seem to have the same problems? Miroslav Lajčák: You know the accession criteria are set and I don't think they have to be changed. They might be fine tuned and they are fine tuned because EU is evolving, it's a living organism, it's going through different stages, right now it's facing, of course, economic problems, financial problems, so obviously the rules of enlargement are not set and they have to be adjusted flexibly but this does not mean that we have to create new conditions or new rules for new countries. But one lesson to be learned probably from the cases of Romania and Bulgaria is that it's really important to make sure that at the moment of entry the country is 100% ready to be a member, because to offer the membership and to still have some mechanisms which are very fine controlling, assessing, doesn't seem to be the proper approach. euinside: So, may be this mechanism to be moved before membership? Miroslav Lajčák: Exactly, exactly. And this is the prevailing opinion among the EU member states and also on the side of the European Commission. It means by the time the country is joining the EU it must be clear that all the conditions are fulfilled, all the benchmarks are met and therefore it's a standard regime and not a continuation of a sort of monitoring or whatsoever. euinside: Do you agree with the opinion more and more analysts share that Serbia is the key country for the success of the region, the European success of the region? Miroslav Lajčák: I believe in individual approach. I believe in countries being judged on the basis of their merits, on the basis of their individual performance, there are bigger and smaller countries, but for the credibility of the process it's really important that we judge each country on individual merits. This is important. So, I don't really understand the notion of a key country. I think that if you define someone as a key country it shows like that the country is more important than the other? This is not a notion I share. We launched the stability pact back in 1999, during Milosevic's time Serbia was not part of it. At that time Milosevic could not believe that there could be a regional initiative without Serbia being part of it and it did happen. As a consequence a year later Milosevic's regime was toppled and we had a democratic government. So, I struggle to understand what this 'key country' means. What does it mean? Shall we treat the country differently, shall we be more generous with the country or more demanding with the country. euinside: It means only that it's the biggest country in the region and it still seems to be hesitating which path to take and still has some really tough relations with its neighbours, especially Kosovo. Miroslav Lajčák: Well, Kosovo is a different story, a special story which doesn't have much to do with the size of Serbia but I really believe in the regatta principle not in the key-country principle. Because that would mean that we have to take somehow the regional approach into consideration which I strongly believe it's a mistake. We'll have to judge countries on the individual basis, according to their performance. euinside: So, the Western Balkans shouldn't be considered as a package? euinside: Whichever country succeeds, it should accede. Miroslav Lajčák: Absolutely, absolutely, the regatta principle worked perfectly in Central Europe and it's totally demotivating if you try to convey a message to a country that you've done your job, so you are too small and you'll have to wait for someone who has not done his homework yet but it's more important to us. This is killing the European idea. We really have to deal with countries and treat them, and reward them according to what do they deserve individually. euinside: And finally, do you think that there is a risk because of what is happening in the EU and in some members, and I mean by some members Hungary and Romania who kind of violated some democratic principles, that this could be discouraging for the countries in the Western Balkans? That the European perspective and the European Union is not the role model anymore? Miroslav Lajčák: And what is the role model? My answer to this question because this is not the first time I hear this question is show me a better model. Show me a better integration of real countries, existing on this planet that have achieved higher level of democratic standards, economic performance and social protection of their citizens. There is none. So, if you say, well EU is not what it used to be, it's not so attractive, fine and what's the option? To be flying around independently, hanging in the Eurasian union, Mediterranean union? Please, it's a strategic choice of each individual country. EU is not pushing any country into the EU. But still, it's definitely the most prominent, the most successful club of countries that has been moving and developing progressively. When you look at the EU today, five years ago, ten years ago, fifteen years ago you see visible progress and I say this is by far the best perspective for the countries in the Western Balkans. euinside: Thank you very much, Minister. Miroslav Lajčák: I thank you very much.